March 20, 2019 . Review by Editor. The Sonichi S100-DAB is an affordable DAB adapter. Performance is good, but the windscreen mount is frustrating. No backlit buttons makes it difficult to use at night. The Sonichi S100-DAB adapter has been available for a few years now. Unlike adapters from Pure and Majority it is sold as a standalone device, rather than a complete solution. This means an aerial needs to be purchased separately. Compared to the latest devices from Pure, Nextbase and others it’s starting to look a little dated. The box doesn’t sport the digital radio tick mark, but the device we tested does receive DAB+ stations. 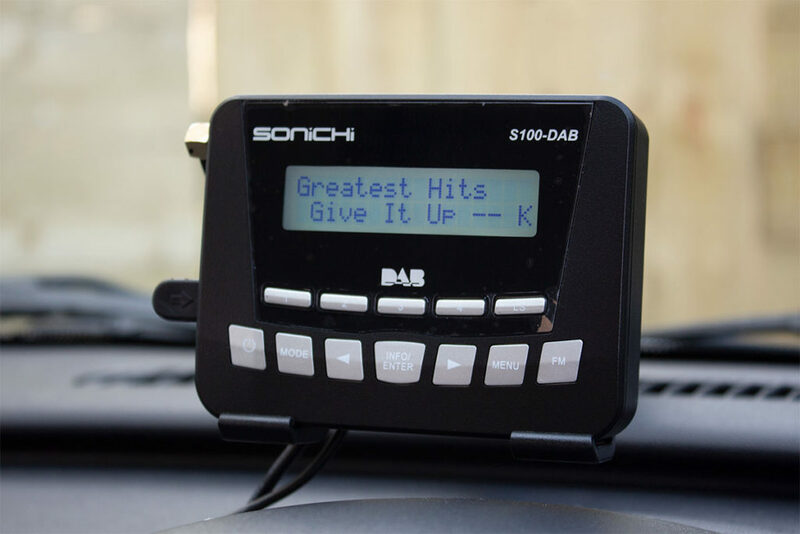 In our Sonichi S100-DAB review we’ll look at the S100-DAB features, installation and using the device on the road. On first impressions the Sonichi S100-DAB looks quite good, if a little large. There’s a two line display to show the name of the station and scrolling text. The row of buttons below the display starts with the power button. In the middle there are left and right buttons for choosing stations, with an enter button in the centre. To the right is a button for the menu and a dedicated button for the FM transmission settings. A row of five preset buttons is found directly below the display. All of the connections are on the left side of the device. The DAB aerial is plugged in at the top, followed by Aux In and Aux Out. The USB mini B socket is towards the bottom of the device. The power cable is included in the box. This plugs directly into the 12V socket. A comprehensive instruction booklet is included. Also included is a mount to attach the device to the windscreen. This comes in two parts: a cradle for the radio to clip into and the windscreen suction mount. The car or van must have a working car radio which can receive FM stations or has an aux-in socket. Fitting the Sonichi S100 itself isn’t much more complicated than setting up a sat nav. Most of the installation will be concentrated on fitting a suitable DAB aerial. 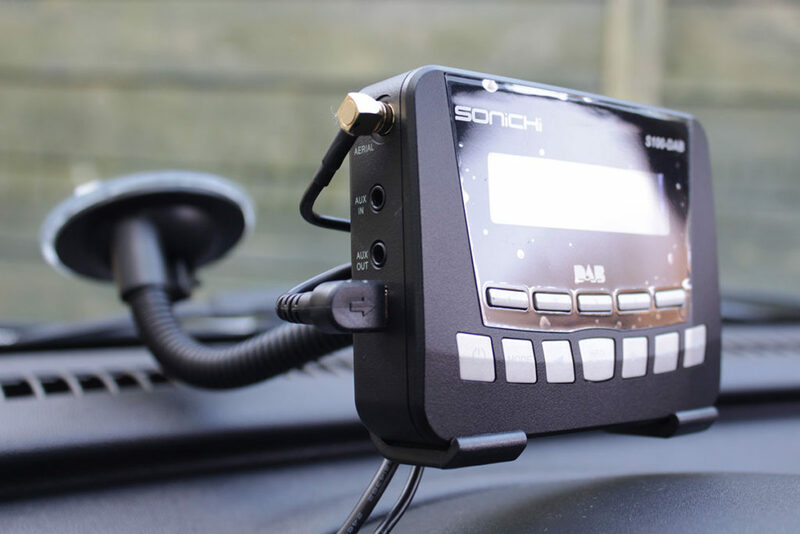 The Sonichi S100 doesn’t come with an aerial, but Autoleads windscreen and magnetic aerials with SMB connectors are compatible. The DAB adapter comes with a windscreen suction mount which has a flexible arm. This should be installed first by peeling the plastic film from the suction mount. This is then pushed on to the windscreen and a plastic clip pushed down to create suction with the windscreen. This clip is very stiff and difficult to push into place. After several gentle attempts the clip shattered and the mount could not be installed. The retailer replaced the whole unit and the new mount was successfully installed. The type of mount found on TomTom satellite navigation units is far easier to use. To the Sonichi’s credit the mount has been fixed for several weeks now and has not come loose. The cradle can be placed on the front of the arm by pushing it down. If the device is at an angle it’s important to pull up a small plunger, make the adjustment by twisting the unit left or right, then push the plunger back down. If the unit is repositioned without pulling out the plunger the mount could break open. With the suction mount and cradle installed the Sonichi S100 can be clipped into place. The power and DAB aerial cables can be plugged in and routed in special channels on the back of the mount. When the DAB adapter is switched on for the first time it will scan for stations. For this review we paired it with a Autoleads windscreen aerial and later a magnetic roof aerial. The device found all of the stations which the digital radio postcode checker suggested we would. The installation process was a little frustrating. The mount and arm feel delicate and having to return the first unit was inconvenient. However, the retailer exchanged the whole unit for a new one without any quibbles. Reading the instructions is imperative to avoid damaging the adapter and its mount. Once the unit is installed and has scanned for stations the interface is remarkably similar to a portable DAB radio. Browsing stations is done with the left and right buttons. Stations are selected by pushing in the enter button. However, if browsing the station list and pausing briefly while a station name is displayed the station will be tuned to automatically. Changing stations and tuning is very quick, but the experience can be frustrating. This is especially true if you can receive many stations and need to press the left or right button 30 or 40 times. Switching between talkSPORT and talkRADIO is quite easy, but switching from talkRADIO to LBC is more difficult when driving. Fortunately presets can be set by pushing the desired preset button once, then holding it in to save the preset. This makes the device much easier to use while behind the wheel. At night it’s difficult to see the buttons on the front of the Sonichi S100-DAB. The screen is backlit but the buttons are not. This makes it possible to see the current station but difficult to see the buttons to choose another preset or browse for another one. Virtually all car radios have backlit buttons, making this an unusual omission. 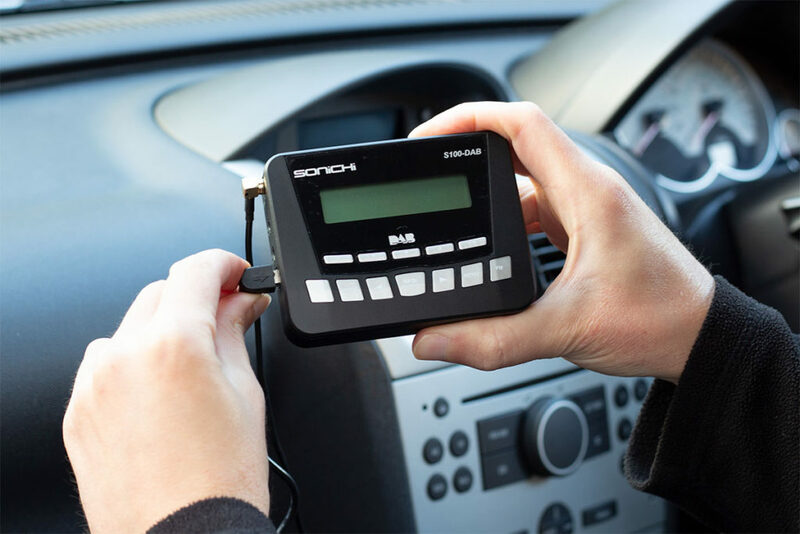 The Sonichi S100-DAB provides audio to the car radio through FM or aux-in. The built in FM transmitter finds an available frequency and shows it on the display. The existing car radio can be tuned into this frequency to hear the DAB stations. We had no issues with this, other than occasional split second interruptions. 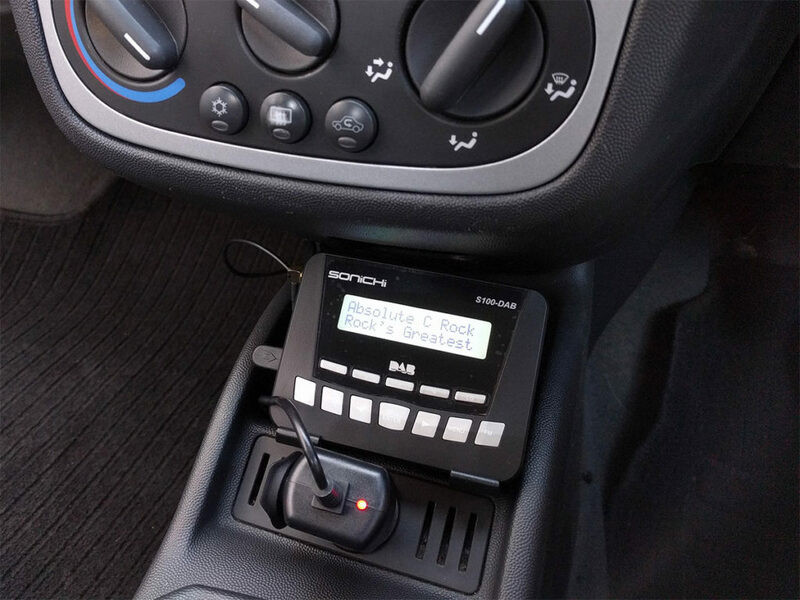 The device has an aux-out socket which can be used with car stereos which have an aux-in socket. This will provide better audio quality, but an audio cable with 3.5mm jacks is not included. Audio quality is acceptable in the Vauxhall Corsa and Mercedes C-Class cars we used to test the device. For the best digital radio sound quality it would be worth considering a car stereo with DAB built-in. We tested the device in the North East with an Autoleads DAB-AA1 windscreen aerial. The unit was also tested with a magnetic roof aerial in the South East of England. 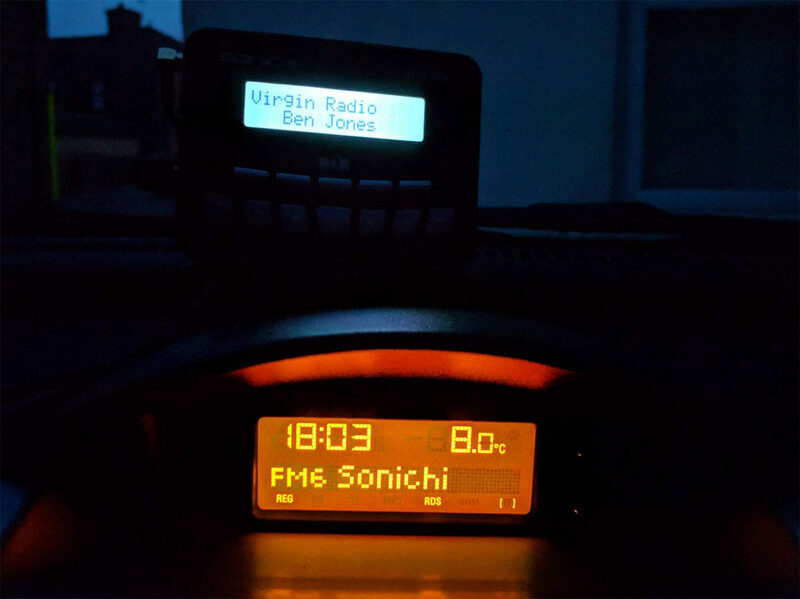 On startup the Sonichi S100-DAB tunes into the station which was listened to last. Tuning is fairly quick when switching on or changing stations. Before performing a scan for stations we used the digital radio postcode checker to see which services would be available. In the tests the device found more stations than predicted. When the signal becomes too weak the audio will drop out, but does return without intervention. Over several weeks of usage DAB reception has been roughly inline with what we would see with other DAB devices. However, unlike an Alpine head unit and replacement roof aerial we have tested before we weren’t surprised or delighted with reception. 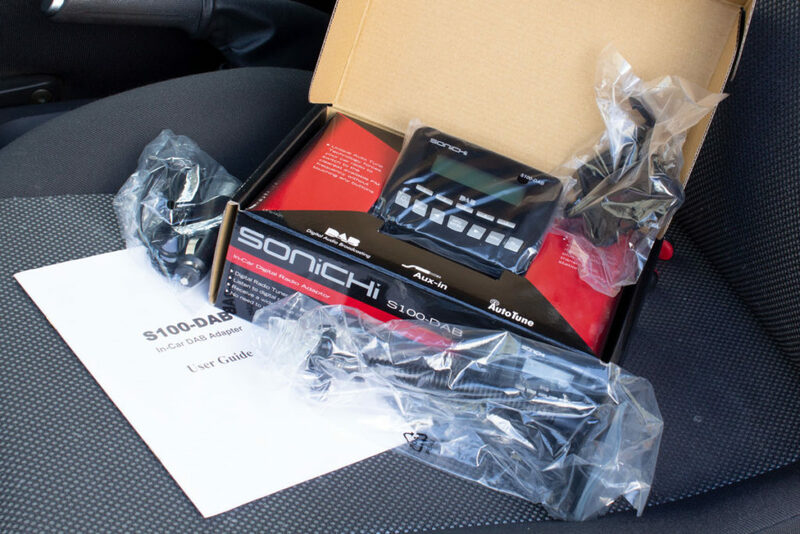 For motorists looking for the cheapest way to add DAB to their car and who seldom change their station the Sonichi S100 is a reasonable choice. The Sonichi S100 DAB adapter is often the cheapest DAB adapter on sale, even once the cost of a separate aerial is added. The device is let down by the windscreen mount which is difficult to install and lets the unit rattle and wobble even on smooth roads. Usage at night is tricky without backlit buttons, although the display is clear enough. Setting presets will make the device much easier to use. The 12V power cable is long enough to position the adapter in a variety of places. Alternatives include the Pure Highway range and the Majority Journey A10.